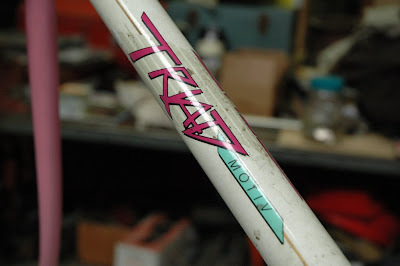 Motiv, known as a low end department store purveyor of comfort and "mountain" bikes, appears to have been on the golden path at some point in the 1980's. If you line up a group of Miyatas, Nishikis, Univegas and Bridgestones, you will discover that the frames are all very similar to one another as they were assembled by the same Japanese frame manufacturer. Looks like Motiv had a couple made by them, too. Motiv made a lot of the same aesthetic mistakes that others made in the 1980's. 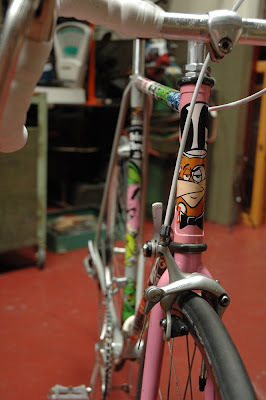 This frame became a donor of components to get another, less "aesthetically challenged" bike on the road. 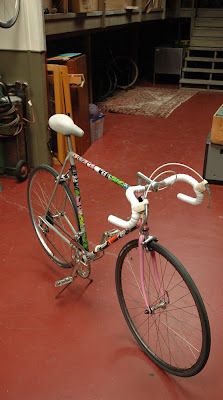 Hanging on a hook and ignored at Coco's Variety for months, I decided I would refashion it into an unstealable bike. 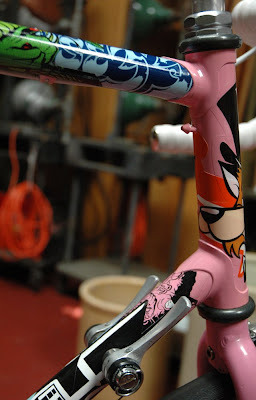 Sure, it is dusty, but that is some pretty decent looking lug work! Each time House Industries sends a parcel, the box is full of stickers. Naturally, they are great and I will occasionally slap one on my PeeChee folder, but it proved just too many to deal with. They make stickers for everything. I mean, just how full of themselves are they? With at least 40 stickers at hand, I thought I could fix two problems at once: Cover the dubious pink/gray/white paint job on the Motiv and use up the pile of stickers on my desk. Thus, I figured, I would create an unstealable bike. Not that it is too ugly to steal, because I think it turned out pretty sick, but nobody would steal it as no human could have the patience to peel all those stickers off. 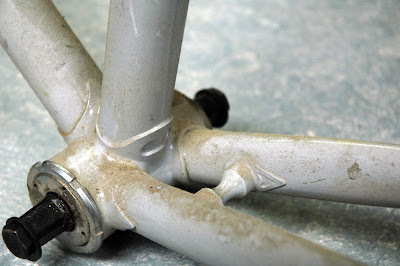 With an X-acto knife, I trimmed around every braze-on, the water cage bosses and around each lug. Rather than looking like a bunch of randomly tacked on junk, I think it gave the lowly Motiv a pretty finished look. 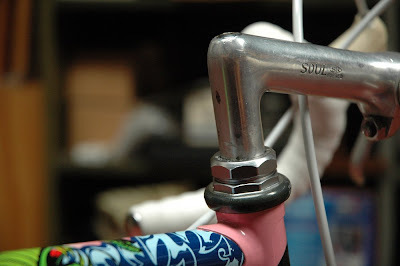 A Soul SR stem and no name Japanese drop bars. A Frankenstein, for sure. All mismatched components. The rear wheel is Schrader while the front is Presta. Everything is Japanese and definitely at the low end of mid-grade quality. 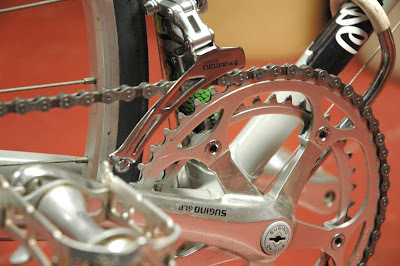 It is like a who's who of non-collectible parts - Sugino, Suntour, SR, Araya, Shimano 105 - yet it rides great. Feels light, rides light.